Lake Wise practices apply to the land surrounding a lake that is within 250 feet of the lake’s mean water level. What is Lake Wise? Managing Vermont lakeshores according to consistent practices, that are proven to protect the lake, will maintain property values, good water quality, good aquatic habitat, good fishing, swimming, boating, bird-watching and more favorite activities around and benefits of Vermont lakes. Using Best Management Practices (BMP) ensures lakeshore conditions are met. 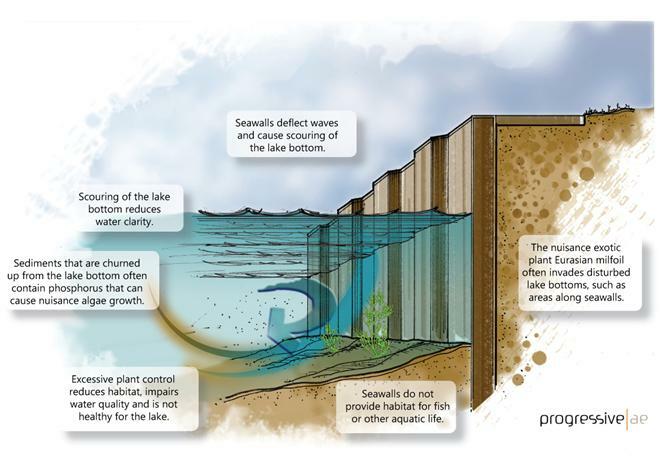 The illustration below is a poster produced by the University of Wisconsin, also applicable to Vermont shorelines, showing the difference between an eco-friendly ‘lake wise’ shoreline and a shoreline that could improve. How does your property compare? See a single page list of shoreland BMP’s. Read a 2017 blog article from the Vermont Department of Environmental Conservation regarding the many aspects of how Lake Wise practices benefit lake and property. 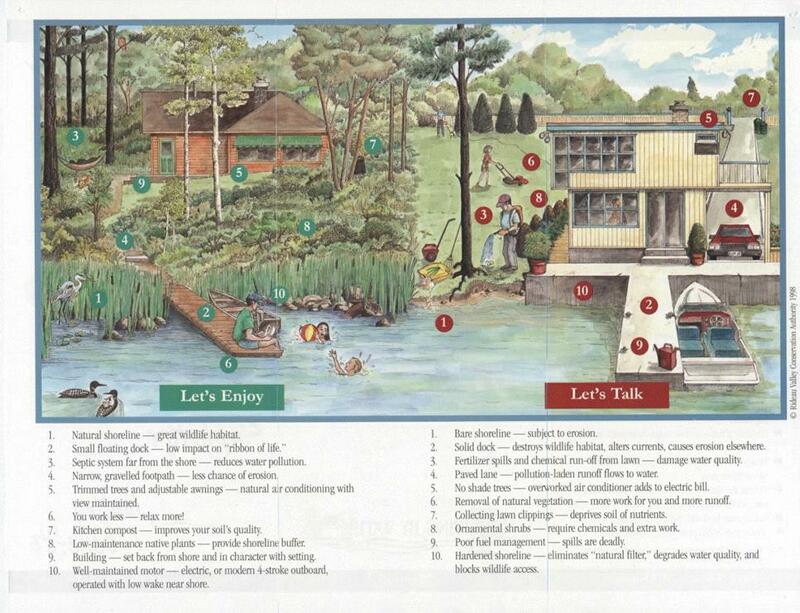 Checkout this helpful illustrated booklet, ‘A Guide to Healthy Lakes Using Lakeshore Landscaping’, created by the Federation of Vermont Lakes and Ponds and designed for lakeshore property owners. 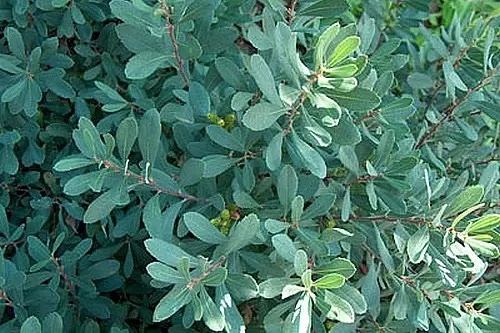 Maintaining a natural shoreline with plenty of native vegetation protects and provides habitat and is better than having retaining or sea walls. 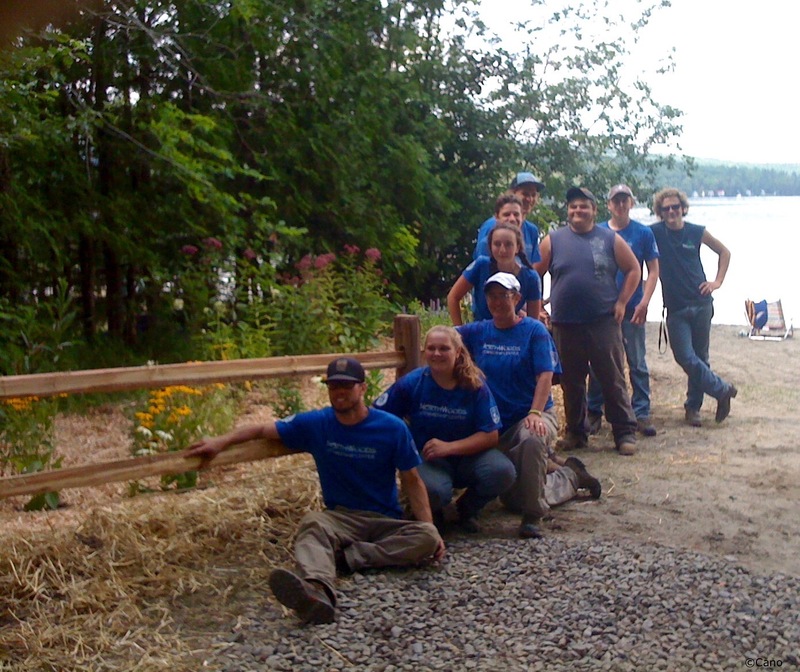 Northwoods Stewardship Center’s Conservation Corps Crew upon completion of Shadow Lake’s rain garden at Glover town beach. In late July 2017, the Shadow Lake Association partnered with the Vermont Department of Environmental Conservation’s ‘Lake Wise’ program; NorthWoods Stewardship Center; and the town of Glover to install 3 rain gardens at the public beach at Shadow Lake. A year of coordination and planning preceded this rain garden project that serves as a shoreland best management practice helping to restore areas of the Town beach and protect the shoreline and water quality of Shadow Lake. 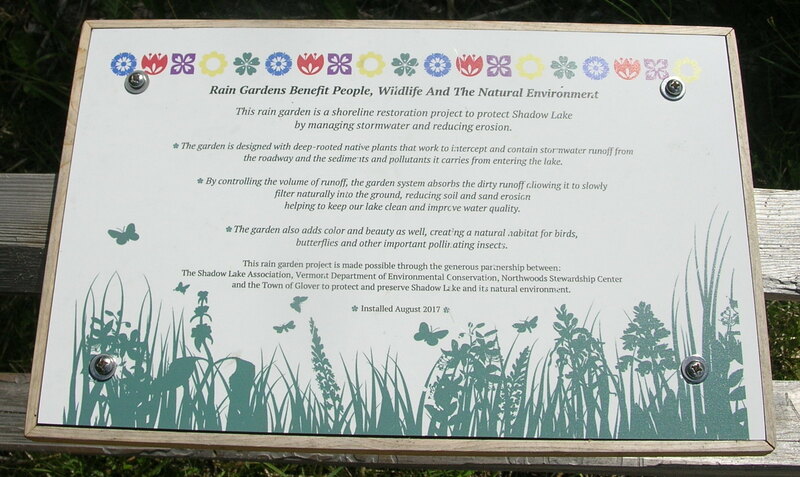 There are many benefits to planting a rain garden but the priority is to infiltrate water and manage stormwater run-off by letting the garden environment manage and slow the water naturally; capturing and retaining rainfall, infiltrating run-off, and trapping and absorbing pollutants before they can reach the waterways. Rain gardens are effective in removing up to 90% of nutrients and chemicals and up to 80% of sediments from run-off. Our new rain gardens keep the beach stable by controlling the volume and rush of run-off to reduce soil and sand erosion from entering and negatively impacting the lake. The gardens are specifically designed with a variety of water-loving, deep-rooted native plants suited to best collect and absorb the stormwater run-off from the roadway. The run-off is now captured and contained in the garden allowing the plantings to soak up the water, sediments and pollutants it carries to then slowly and naturally filter into the ground. The gardens also add beauty and create a natural habitat for wildlife by providing food for birds, butterflies and other important pollinators. Read the October 2017, VTDEC ‘Flow’ blog article highlighting recent Lake Wise shoreline restoration projects at different VT waterbodies including the rain gardens at Shadow Lake.